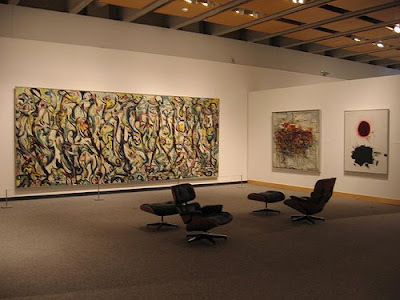 jackson pollock's mural from 1959, discovered hanging in an old iowa barn, covered in bird doo, cleaned up and donated to the museum of art at the university of iowa. these pictures, which were the best i could find late at night from an infernally slow connection in a hotel, with a scheduled blogger outage hanging over my head, do not do the painting justice, but i do love that eames chairs they've put there near the painting now, that's a nice touch. this magnificent and enormous painting was my first exposure to modern abstract art. at first, i thought it was a lot of blodges of paint, but soon, images began to emerge and i began to see movement and could almost hear music singing from the canvas. the museum does justice to the painting in the way they've hung it (especially now with the eames chairs) and it's never too crowded, so you can enjoy it in peace (having great works of art to myself is fast becoming a theme in these postings) most days. it was a striking moment for me and one of my first moments of really appreciating a painting. i suppose it was part of a general awakening to the world that happens during college, a rejection of the familiar and an embracing of the unknown. it made me feel free and i had that sense that i sometimes get (usually in the lobby of the manila pen) of my molecules aligning perfectly and humming in perfect harmony. a marvelous painting. definitely one to see. Cool. What a great save! I am a total Jackson Pollock NUT. Love his work. Love. I would probably trade in an ovary for a gander at this painting in person. Cathedral hands in the Dallas Museum of Art, and it's a religious experience every time I see it.